Thelon Riverby Bill LaymanCopyright © 2001, Bill Layman. All Rights Reserved. Reprinted with the permission of the author. There is a question that haunts my mind each winter as I sit and wait for our next summer`s canoe trip to the north - "What is it about the land of little sticks and the barrens that draws Lynda and I back year after year?" Is it the snake-like yellow sand eskers that rise high above the deep blue lakes teaming with red-fleshed lake trout? Is it the herds of caribou that seem oblivious to our very existence as they stroll through our camp? Or perhaps it is the families of shaggy musk-oxen that circle around their young as we paddle by? Could it be the sight of a lone white wolf that watches us casually as it trots along the crest of a ridge by river`s edge, until suddenly appearing tired of us, it heads inland on a new quest? Or what of the high tundra camp spots where the smell of peat fields wafts over us where we sit under our kitchen tarp sipping tea and looking out over the blues and yellows and pinks of a sea of tiny arctic flowers? Is this what draws us back? Surely the feeling of complete independence and total purpose that I feel as I stand alone in a rugged rock strewn land where I am master of my entire universe forms a large part of the answer. The confident elation that comes after running a wild foam filled rapid or after lining through a steep walled canyon where peregrine falcons wheel high overhead could be much of what pulls me back .. and yet these are just things easily remembered that can be explained to those who ask, "Why do you go to the barrens?" And when I say these words I know there is a much deeper answer, and try as I might I can`t remember what it is -- can`t remember that is until I am back there again --back on the tundra. And then, as always, in some indescribable way, I feel the magic of the tundra fill my soul again. Those who meditate say you should be prepared to chant your mantra hundreds of thousands of times before it works its magic and calms and soothes your soul. I thought of this as I paddled nearly five hundred thousand strokes along the Thelon River this summer, and each stroke felt like a single repetition of my own personal mantra. And as I did so, I felt a calm and a sense of inner well-being that grew within me day after day -- until at trip`s end, I felt as if I had the answers to the very secrets of the universe. And yet as I write this the answers have long ago vanished, as they always do, and I know that it isn`t that I failed to chant my mantra properly. For I now know something about that so hard to describe feeling of soothing calm that I search out on the tundra, and which eludes me when I return to my home in La Ronge. The answer is the tundra herself -- and she will gladly share her beauty and magic with you when you visit her -- but when you leave she wraps her shroud of magic tight around her shoulders and turns away from you. And, as would a lover, she waits and beckons to you until the anguish in your soul forces you to return to her once again. And when you do, she unfolds her arms and shares her beauty and warmth with you -- and your heart melts and her soothing calm fills your soul once more. Our trip started on Vermette Lake on the fifth of July following a 150 mile air charter north from Stony Rapids, Saskatchewan to the headwaters of the Elk River in the Northwest Territories. Running from south to north for 120 miles the Elk ends at Granite Falls where it joins the Thelon River just upstream from Jim Lake. The first 60 miles of the Elk is flat water paddling as you make your way through Vermette, Rennie and Damant Lakes. The remainder of the river is narrow, fast flowing , and has a few days of great whitewater paddling. The Elk cuts through the northeast - southwest `strike` of the geological features that were left behind as the glaciers of the last ice age retreated from this sandy countryside some 7000 years ago. Rivers that flowed under the melting ice that covered this land left behind many of the jewels of the north -- the eskers. And if the eskers are like jewels then the Elk is surely a diamond mine. The eskers on this river are truly spectacular and make for absolutely magnificent camping. This was, and still is, the land of the Dene and it is the wintering range of a large part of the Beverly caribou herd that returns to the area about the middle of August each year. Called "the land of little sticks" by the Dene, the small black spruce trees are few and far between. The sandy soil of this country makes for a perfect area for wolves to den and their tracks are everywhere. Although still far to the north following the caribou, large packs will return in the fall as they dog the herds that they subsist on. The Dene from Fond du Lac, 150 miles to the south-west, still actively hunt and trap this area. As he has done with his wife Lena for the last 25 years, Lawrence Adam, from Fond du Lac, spends freeze-up -- from mid-September to mid-December -- in the land of little sticks hunting caribou and trapping wolves. No less a part of the land than the animals he pursues, Lawrence, one of the last of the big trappers of Saskatchewan`s north trapped 175 wolves out of the Rennie Lake area last year alone. This area on the edge of the tree-line has a rich Dene history and you can still see the signs of ancient occupation. We found several flaking sites -- places where hunters sat making quartz spear points, hide scrapers and arrowheads -- and another kill site between Rennie and Damant Lakes where these same hunters had intercepted the fall caribou herds as they returned south. Anywhere else the last lake before Granite Falls would have a name. Perhaps Emerald Lake, or Golden Sand Lake, or some other name that would vainly attempt to describe its spectacular beauty. The day we crossed it was blue with the skies of summer as we paddled into the perfect reflections of soft white clouds and the surrounding yellow eskers coloured with the green slashes of the infrequent stands of spruce. Then follows a few hours of wild rapids leading to what Lynda and I felt was the highlight of the Elk, Granite Falls. A narrow series of S-turns confining the full force of the Elk into a canyon carved from soft red-brown granite -- the colours more reminiscent of the south west mesas of Arizona and New Mexico than of the tundra - Granite Falls is a sight to behold. Camping here overnight, we hiked the canyon and marveled at the ever-changing colours of the rock walls as the sun lowered on the horizon and peregrine falcons wheeled high overhead. The shallow, fast, and rock studded river past Damant Lake is a lot of fun if you have strong slower than current skills (front and back ferries) and are comfortable in 2 + rapids. With only one short (less than 1/2 mile) mandatory portage on river right at UTM 6882N / 13-4825E and a mandatory variable length portage on river right at Granite Falls this is a relatively easy river. We lined river left at two spots (UTM 68764N / 13-4865E and 69185N / 13-5060E) and ran well over 20 rapids that were just plain fun. Only once did I get that gut-wrenching feeling that one likes to avoid on any remote trip. This was just after Golden Sand Lake where the river starts again as it races through its last few miles to Granite Falls. Just above the second rapid that we lined (we lined the top half and ran the bottom from river left to center) we ran a tight left hand corner on the inside without scouting. Everything worked out just fine but this is a real pushy corner and what shows up as you slide around it is an "in-your-face" mile of real big pushy white water. Failing to make this corner would leave you in a real bad spot with a long nasty swim. So as the doctor would say to you, "Do as I say -- not as I do! ", -- probably best if you scout this corner from river left before running it. As well, be advised that many people choose to carry around this mile of rapids which follows the corner. So depending on the water levels, be prepared for a possible portage on river right. A few miles below this rapid, we easily ran the river right up to within feet of the top of Granite Falls where we carried over an excellent very easy 3/4 mile portage on river right. We put in just below the end of the canyon and well above the last rapid where the river makes it`s last S-turn. The next morning we ran this last rapid easily on river right -- choosing to carry it would extend the portage by about another 1/2 mile. It is worth noting that if you can`t catch trout and grayling on the Elk, "You ain`t gonna` catch `em nowhere son!" - the bottom of each of the myriad of rapids are packed with gorgeous firm-fleshed lake trout and the shimmering iridescent hues of grayling. Large pike also abound. The Thelon River is probably the best river we have ever paddled for wildlife viewing. It is also the best river to get eaten alive by mosquitoes and blackflies - they are horrific so be prepared! Within half an hour of paddling into the Thelon Game Sanctuary - set up in 1927 by the Government of Canada as a preserve for the then endangered musk-oxen -- we saw three wolves and four musk-oxen. One of these appeared to be completely unconcerned when we paddled the canoe within feet of her -- Lynda insists it was a `her` as it was so gentle -- where she could have easily touched `her` with an outstretched paddle. We watched this shaggy creature for over ten minutes as `she` grazed the tops of dwarf tundra birch. All told, we saw over 30 musk-oxen (one group of 21) , 7 moose, 6 wolves and countless lone caribou. As well the river is bird watcher`s paradise. The well-treed valley is home to thousands of geese and a myriad of other birds - I have never seen so many peregrine falcons anywhere in my life. We didn`t see a grizzly bear but we found many sets of tracks and one place where a bear had casually opened a well- hidden and rock covered food cache box. Made of 3/4 inch plywood, and the top screwed down with 24 2-1/2 inch deck screws, the bear had simply used the claws of one paw to open it like a beer can! As to the biting insects - be prepared for bugs like you have never seen before. One day at lunch, as we sat under our kitchen tarp, I watched as thousands of blackflies massed into the inside front corners of no-seeum-netting where they were trapped. I reached up about 3 feet and rubbed my hand down the netting and was then able to scoop up enough blackflies to literally fill my two cupped hands - I estimated them at easily more than 5,000! The Thelon is rich with history. Towards the confluence of the Elk it is the history of the Dene. Towards Beverly, Aberdeen and Schultz Lakes it is the history of the Inuit who now live in Baker Lake. And all along its length, there is a fascinating history of the European explorers and trappers who ranged over the area in the late 1800s and early 1900s. The only single book that recounts the complete story of this river is Thelon: A River Sanctuary by David F. Pelly (ISBN 1-895465-21-4). From the geologic history, to the aboriginal and European history, to the formation of the Thelon Game Sanctuary, it is all in this book - the bibliography alone is worth the price. 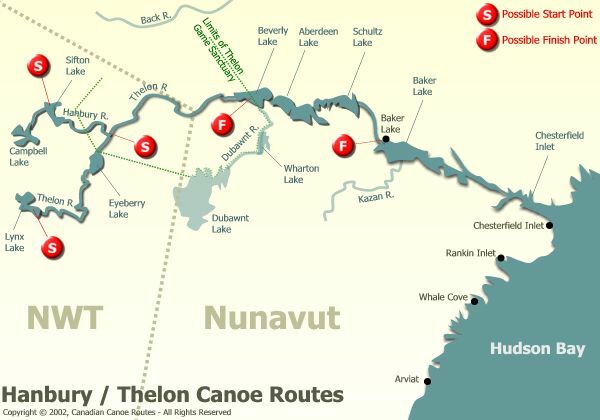 The most popular section of the Thelon is from the Hanbury-Thelon junction to Beverly Lake - a distance of about 230 miles -- with charter flights originating in Yellowknife. Although a nice stretch of river, Lynda and I both agreed that the sections upstream and downstream were more to our liking -- and of course you will likely not see many people on these sections. .Yikes!! Skill aside, there was a large measure of good luck that saw us safely through the canyon, and I am not sure I would try it again. The MIDDLE Thelon - from the Hanbury junction to Beverely Lake - is well into the Thelon Game Sanctuary. It is a broad fast flowing river with no rapids of any real concern. This is the best section of the river for wildlife viewing -- from wolves to musk-oxen to caribou to moose to grizzly bears, to arctic hares to sik-siks, it is all here. The guide of a small group we met had been on this section ten days earlier and had witnessed "la foule" -- the migration of the entire Beverly caribou herd -- and estimated the caribou in the tens of thousands. One of his clients, a young first time customer from Albany, N.Y., happened on a huge grizzly bear within 50 feet of his tent one night when he went out to relieve himself! Along this stretch you can visit what remains of the original warden`s cabin built in 1928 by Billy Hoare and Jack Knox and the newer one built beside it in 1961 by one of the trapping legends of Saskatchewan`s north, Fred Riddle. Much of the middle of the river is sheltered in a well-treed narrow valley -- the so-called Thelon Oasis -- so the chances of getting wind bound are slim. Even if you do you can make up miles in a hurry on a good day -- 12 hours of hard paddling could easily see you move 50 to 60 miles. As you float by the Gap -- a mountainous rock formation that towers hundreds of feet above the river -- you begin to feel as if you are on a mountain river somewhere in the Rockies. Then suddenly you cut through a narrow opening and are thrust back into tundra shoreline interspersed with sand beaches and eskers. Other sections of the river wind through thinly layered sandstone S-turns. Floating by these sheer walls, the multi-coloured layers looked to us like something made by the hand of man and we were reminded of the Anasazi ruins we had seen during winter trips to the American south west. and then as we listened to the haunting sound of loons we watched as the shoreline reappeared mere feet before we paddled into it. When we finally decided to camp for the night we drifted into a beach and watched as several of the large rocks came to life and disappeared into the mist -- a small group of caribou. And then the next morning when we awoke to a hot sunny day we saw where our new friends had come back to sleep on the beach beside us. Aleksektok Rapids marks the end of the large lakes. This is a big piece of ferocious whitewater. Just past the tight right hand corner there are several holes and ledges that are not easily avoided and could easily swallow an elephant. The cross on the hill bears grim reminder of what can happen if you have trouble. We paddled down an easy channel right of center and worked our way along this margin until just before the corner where we did an aggressive front ferry into a boiling tight eddy - the kind of eddy where I couldn`t quit paddling until Lynda leaped out and held the front end of the canoe. From here I easily lined the boat a few hundred yards past the worst of the rapid and then we paddled the bottom. Alternately the portage is about one mile on river right. From here the Thelon is like a bob-sled run - you could easily run the entire 50 miles in about 8 to 9 hours. There is a good article about the Thelon River in Canoeing Canada`s Northwest Territories: A Paddler`s Guide, edited by Mary McCreadie. By barren land standards this river is easy - especially the MIDDLE section -- but don`t forget where you are. Any mistake, no matter how small, when you are so far from help can have serious consequences. As I have said before, plan in a double redundant fashion - in other words have a back-up plan when your first plan fails! As the famous arctic explorer Vilhjalmur Stefanson said, "An adventure is a sign of incompetence -If everything is well managed, if there are no miscalculations or mistakes, then the things that happen are only the things you expected to happen, for which you are ready and with which you can therefore deal." In addition to the regular first aid and survival gear necessary for any canoe trip, Lynda and I carry a VHF radio that we can use to talk to aircraft. If you buy or rent one of these units for your northern trips, familiarize yourself with the local air schedules, the frequencies that the planes use, and general radio protocol. I also carry a Personal Locator Beacon (PLB) sold by ACR Electronics, Inc.( http://wwwacrelectronics.com/ ) that is strapped to the back of my life jacket in case we capsize and lose our gear. These units should be mandatory on canoe trips rather than the much cheaper EPIRBs that seem to be the common choice of American canoe camps. The signal from the EPIRB is not coded and a GENERAL, rather than specific, search is immediately initiated. This unfortunately usually involves launching a Canadian Armed Forces Hercules transport planes -- at a cost of about $10,000 per hour -- that assess the situation and then usually call in rescue helicopters at an additional cost of about $1000 per hour. My feeling is that it is false economy to buy the cheaper EPIRB and in fact last summer I am personally aware of two very expensive searches that were initiated when EPIRBs were set off. The cost of these two rescue attempts would buy a lot of PLBs! This year I took a GLOBALSTAR satellite telephone ( USA http://www.globalstar.com/ CANADA http://www.globalstar.ca/ )along to try out. WOW is all I can say! -- every canoe in the world should have one of these. About the size of a portable phone in your house, I was able to a series radio interviews from the river without ever losing the signal or re-charging the battery and the quality of the phone conversations is as good as any land line. If you are interested in hearing the about 85 minutes of live-from-the-river taped interviews about our trip contact me at layman@rongenet.sk.ca . The cost is $12.00 US funds ( 17.00 Canadian) plus $4.00 US funds ($6.00 Canadian) for shipping (money orders only please). One final safety note --- Ensure you register and de-register your trip with the RCMP at the beginning and end of your trip. If you want to take a look at some real good canoe equipment that will make your trips a lot more fun and comfortable take a look at the following suppliers. Carlisle Paddles (http://www.carlislepaddles.com/) , Marmot Mountain Limited (http://www.marmot.com/, Northwest River Supplies (http://www.nrsweb.com/ ), Zaveral Racing Paddles (http://www.zre.com/ ) and Coleman Company Limited ( http://www.coleman.com/ ). These folks make excellent gear and I used equipment from each of them this summer --- believe me if will work for me on the tundra it will work for you anywhere! And last but not least, for camp food that is inexpensive and doesn`t taste like cardboard take a look at http://www.bearcreekfoods.com/ for Bear Creek Country Kitchens. Try their Spinach Parmesan Bread with "Damn" Good Chili for a meal to die for -- and for desserts you haven`t lived until you have tried their Chocolate Chip Fudge Brownies or Lemon Poppy Seed Cake! All the information you need to start and end your trip on the Thelon River out of Yellowknife, Northwest Territories is included in McCreadie`s book or can be obtained by phoning the Northwest Territories Arctic Tourism Office. There is also a new way to get into Thelon country from Stony Rapids, Saskatchewan with Northern Dene Airway`s (NDA) - they have a Single Otter, a Beaver and Cessna 185s for charter. You can drive to Stony Rapids from La Ronge on the new `tote` road from Points North Landing, or if you choose you can take the daily scheduled flight from Saskatoon to Stony with Athabaska Airways. Things change fast in the north so phone Dave Webster at NDA to get an update on the best current options and whether your vehicle is suitable for the `tote` road. On the topic of fast changes, I recently stayed at The Whitewater Inn in Stony Rapids before our trip and the room, food and service were excellent and reasonably priced - a big change from years back let me tell you! NDA has 17 foot covered NOVA CRAFT prospector canoes for rent or if you want you can rent canoes from Ric Driediger at Horizon`s Unlimited 50 miles north of La Ronge. At trip`s end you can camp in a nice little community campground for $5 per person per night at Baker Lake, BUT for my money I`d stay at the Baker Lake Lodge run by Boris and Liz Kotelewetz. They run a great facility and Boris has his finger on the pulse of the area - phone him before you start your trip to establish the best ways of getting you and your canoe home from Baker. He also has canoes to rent and usually has a tundra tire Twin Otter that you can charter if you choose to start and end your trip at Baker Lake. Faye at North Star Tours in Churchill, Manitoba can get all your arrangements made for flights from Baker, train tickets from Churchill, hotel rooms, etc. Talk to Liz and Faye about what there is to see and do in Baker Lake and Churchill and consider spending at least a day in each place if you can .. these are both great communities to visit.